I’d like to start cooking at home more again. I’ve said that before, though. One of the challenges is that I spend a lot of time alone at a computer writing or editing photos. I’m not great about setting aside the time to make cooking and eating a meal its own activity. Instead, it becomes part of the workflow. A compromise that works for me is finding local places where eating alone doesn’t really feel like eating alone. It feels more communal. Capitol Hill’s Corvus and Co. is one of those places. It’s owned by Paul and Izzy. I’ve heard the story several times now about how an Australian (Paul) and a Southern California skateboarder (Izzy) found their ways into the Seattle restaurant and bar industry, met, and decided to start their own bar, but I’m sure I’d get some of the specifics wrong if I tried to describe the story here. Next time I’ll take notes. I never get tired of hearing stories like that. I do know that they bought what had been a Greek restaurant at the corner of Broadway and Mercer and turned it into a vibrant part of this quieter section of Capitol Hill. On any day at any time you’ll run into people who live and work in the neighborhood. It’s a fairly small place, but it punches well above its weight. Serene runs the kitchen, and she is a food wizard. If you only go for the food, though, I think you’d be missing out. The entire staff is great. Between them, I think they know everyone in Seattle. Grab a quiet drink at the bar on a few different nights, and I bet you’ll walk away feeling a little more connected to Capitol Hill. You’ll probably also meet a few dogs. I’m getting old, so I prefer the quieter nights. If you like closing out the weekend with a good drink, I recommend Sundays. They’re always playing good music, and something quirky will be on the screen (no sound). Be sure to check out their new drinks menu. Local artist Kate Berwanger has turned the bartenders’ creations into a zine-like piece of art. There are low ABV options, and they serve a good ginger beer (no alcohol). I didn’t set out to write much about Corvus. My intention was to post a couple of photos I took there this weekend. Here’s where I should add a disclaimer: I might be shooting some cocktail photos for them soon. This isn’t an ad. I’ll be shooting the photos regardless of whether anyone reads this post. If anyone reads this and visits, that’d be great. Corvus Breakfast. Eggs to order, toasted brioche, hash browns (they were perfect), sautéed greens, and roasted tomatoes. You can add bacon, too. Fujifilm X-H1 | ISO 10000 (not sure how I let that happen) | f/5.6 | 1/60th. Chicken Stew. I need to go back and read the description - it’s a skillet full of delicious. I don’t eat a lot of meat, but I’ve been hearing people talk about this dish for a while now, and it always looks so good coming out of the kitchen. It was fantastic despite the lousy photo. Fujifilm X-H1 | ISO 200 / f/7.1 | 1/250th | Godox TT350F wirelessly triggered with a Magmod CTO and grid. All that effort for a bad photo. 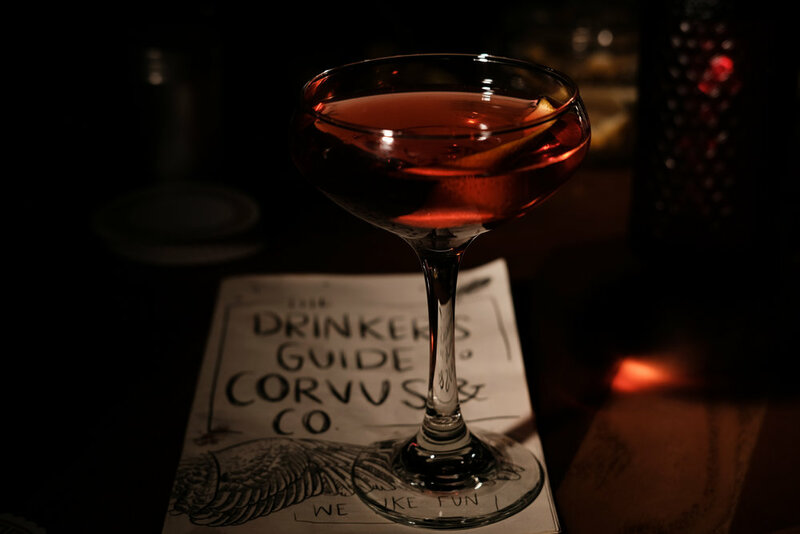 Boulevardier by Kenna, Drinker’s Guide to Corvus by Kate Berwanger. Fujifilm X-H1 | 200 | f/7.1 | 1/250th with Godox TT350F.